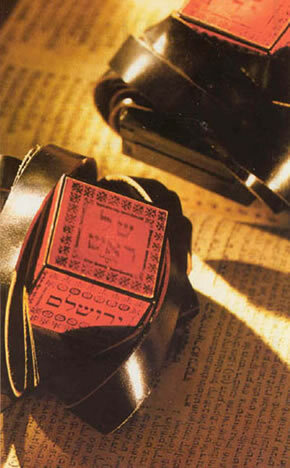 Tefillin (literally phylacteries) are small black leather cubes, or boxes, containing parchment scrolls inscribed with the sacred Jewish prayer, the "Shema". Jewish adult men are commanded to wear Tefillin on their arm and on their head during weekday morning prayers. Tefillin Club is a monthly opportunity, for Jewish men and boys over the age of Bar-Mitzvah, to learn about, acquaint themselves with, and gain appreciation for, the rich and enriching Jewish practice - the Mitzvah - of donning Tefillin. on the 1st Sunday of every month at 10 AM, to learn about Tefillin and how to wear them, and to recite a short prayer with them on. Then stay with us for an informal, delicious, Kosher breakfast and some light Jewish Shmoozing. Bring along your burning questions about anything Jewish. Tefillin is the name of the game! Bring your own Tefillin. Or, if you don't own a pair, we have a set waiting for you to use! about our Mezuzah & Tefillin Bank, where you may purchase a pair of Tefillin, or apply for a discounted or free set. 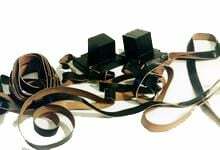 So What's So Hot About Tefillin Anyway? Judaism teaches that all of the Jewish commandments (Mitzvahs) are equal to the single act of donning a pair of Tefillin. Imagine that! In one instant, on a fine Sunday morning with Chabad, you can lay claim to your rights as a proud "Badge Wearing" trooper in the eternal history of "Your People". Our Sages also teach that the Mitzvah of Tefillin serves as a protective shield against any and al l anti-Jewish threats. So, by turning on your "Tefillin Power" you can provide additional safety insurance for yourself, your family, and all of Israel. Come to Chabad the next time it's the first Sunday of the month and see how easy it is to become a member of the Tefillin Club!